Most of the palaces, pavilions, and villas built in the Safavid period have not survived. 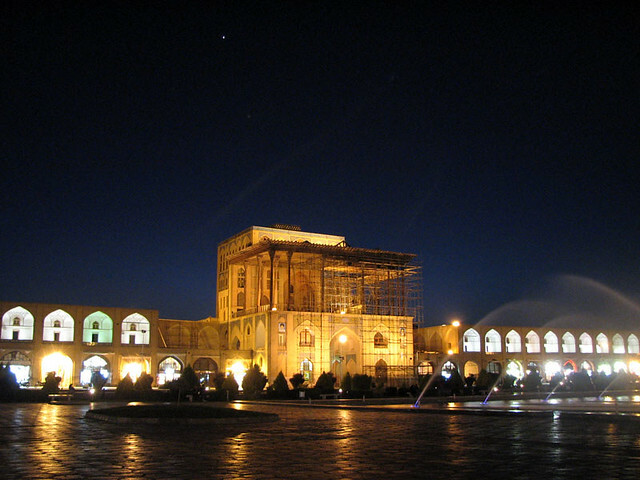 Many were destroyed, especially during the Afghan conquest of Isfahan in 1722. Others were neglected and left to decay, or fell victim to earthquakes. Of those that remain many have been altered in their outward appearance by structural changes. Fortunately, European travelers of the seventeenth and eighteenth centuries have left sketches and drawings of several of them, so if we can no longer discern function and ground plan, at least we can gain an impression of general appearance. 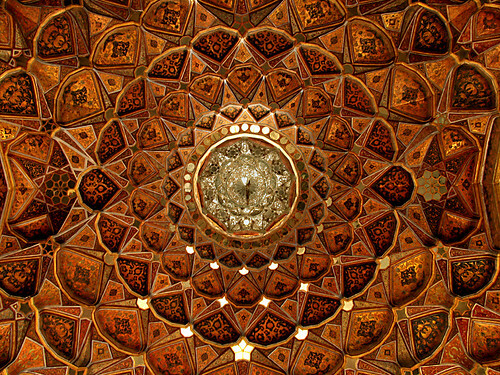 Knowledge about the details of plan, form, and function of both large and small Safavid palaces can be gathered from the number of palaces and ruins that remain in Isfahan, Qazvin, in small towns, and in the countryside.1 Safavid palace architecture—as can be verified from the still extant buildings in Isfahan—marks the climax in the development of Iranian palace construction. Fig.1: Ground plans of (A) the Sasanian building at Damghan, (B) the "Sasanian" palace of Sarvistan, (C) the Safavid palace of Talar-e Ashraf in Isfahan, and (D) the palace near Natanz with the tripartite arrangement of parallel axes. FIG. 2. Aliabad near Furk. Plan of the palace building. In Iran, the art of building showed great concern for tradition throughout all periods of Persian culture. Thus, Achaemenid motifs were still in use in Parthian architecture, and details of Achaemenid columns, like the double-protome capital, can still be seen in Tehran on twentieth- century buildings. In view of this, it is not astonishing that similar organizational principles remained in use from late Sasanian to early Islamic times. Usually it took the form of a tripartite arrangement composed of three parallel axes sometimes constituting a cross-axial plan. This system can be observed in its early form in the so- called Sasanian palaces near Sarvistan2 (fig. 1; the date of Sarvistan is still uncertain) and near Damghan (aboutwhose hypothetical reconstructions Lionel Bier has raised some doubts elsewhere in this volume). Its later, more common, form of ground plan and distribution of rooms can be seen in the Safavid palaces of the seventeenth century, like that of cAliabad near Furk (fig. 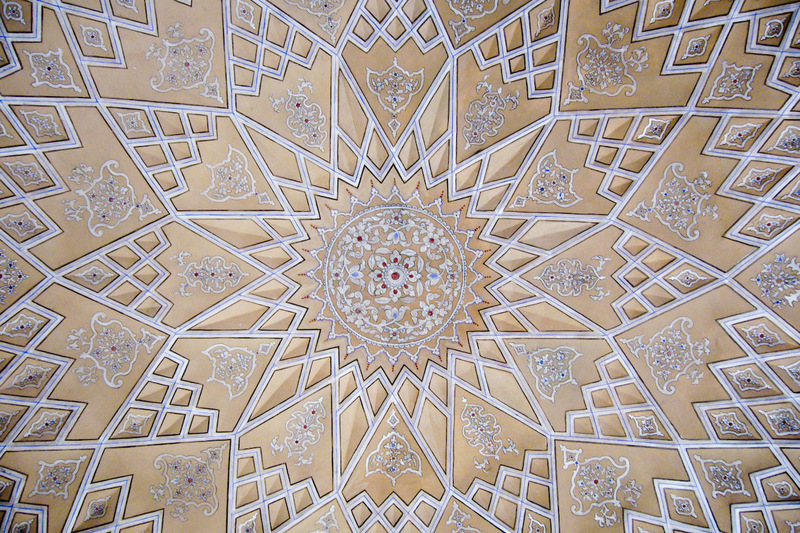 2) in southern Iran.3 It was later handed down to the Qajar architecture of the nineteenth century. It is important to stress the similarity of the tripartite organizational system in the building of Sarvistan and in seventeenth-century palaces, and the fact that only Islamic pottery can be found in the area around the domed building of Sarvistan. No matter when it was constructed it continued to be used without any significant change in its architecture into the Islamic period. In the ground plans of many Safavid pavilions the Achaemenid apadana can be recognized, with its four iwans opening onto the outside and its four corner buildings or groups of rooms, like those in the pavilion (fig. 3) east of the Hasht Bihisht in Isfahan, the remaining parts of which were recorded before its complete disappearance several years ago. 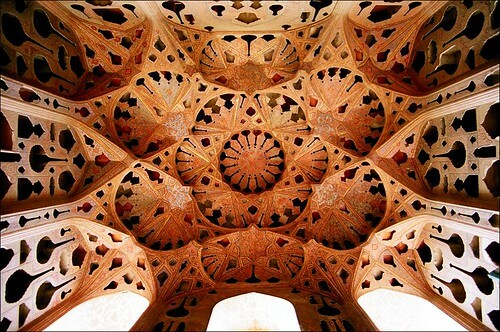 The form is also seen in the late Safavid-early Qajar pavilion at the citadel of Bam (fig. 4). There were also villas belonging to rich landowners and seats of the royal court in the countryside. We do not know to whom they belonged or what the position of a particular owner was. An example is cAbbasabad, north of Natanz (fig. 5) on the old road from Natanz to Kashan, a mud- brick building on a foundation of rubble which also uses the tripartite system of organization in its layout.5It is a typical domed hall with one story, part of which was divided into two stories by inserting a floor in between to provide living and storage units. The building opens toward a water basin and a rectangular terraced garden. A cypress on a mound dominates the garden on its main axis. Fig 5: (E) section of hall and iwan, (F) section of the main axis, (G) cross-section of the domed space. Tajabad,6 on the caravan route from Isfahan to Natanz, also belongs to this group (fig. 6). It is situated in a large garden with fountains and water basins and was connected with a farm. 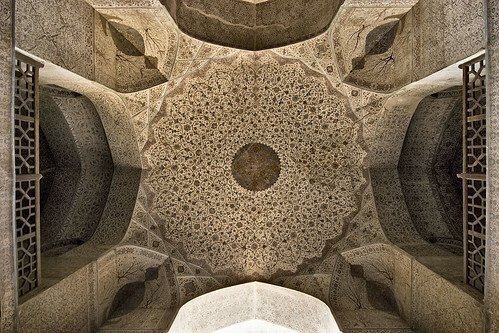 The complex also includes a bathhouse of Safavid origin. The tripartite structure of the main building is cross-axial. The rooms are richly decorated with painted stucco; some of them have domes. Another domed building in the park of the complex at Tajabad (fig. 7), the conception of which had originally been a very regular cross-shape, was obviously never finished; its architecture has changed considerably over the years. Fig 7: Tajabad Palace. (top) Plan of ground and upper floor, (bottom) longitudinal section of the front of the south side. 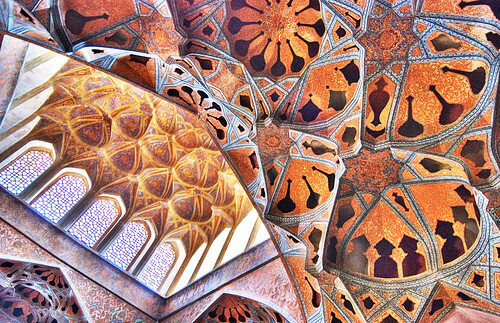 In Isfahan palaces and pavilions of diverse sizes and functions did exist, but they were pulled down in the course of time. One of them was the Talar-i Ashraf which had a cross-axial tripartite arrangement similar to that of the building in cAliabad near Furk (fig. 2) or the viewing pavilion at the north end of the Chahar Bagh avenue, which fell victim to modern development. The pavilion’s facade is known only through old photographs (see Necipoglu, fig. 10a ). A special type of ground plan is the eight- or sixteen-sided pavilion, like that in the Rose Garden at Isfahan (fig. 8; see also Necipoglu, fig. 10a [r]), which is known only through some drawings by Engelbert Kaempfer7 who accompanied a European embassy to the Safavid court in 168485. Another pavilion of this type (which still exists) is the octagonal tower-shaped building visible from afar on its steep conical mountain (fig. 9) above Natanz.8 It was a royal hunting pavilion which the monarch used when he was in residence near Natanz to hunt the numerous deer there. Yet it may equally well be called a mil, a landmark for caravans, because of its exposed position and its tower-shaped high outer dome. From the so-called summer residences of the Safavid kings near the Caspian Sea, Farahabad, situated on the coast and now in ruins, may be reconstructed in its outward form with the help of nineteenth-century drawings, like those of the Jahan-numa palace (fig. 10). Its cubically massed shape is rectangular, with a symmetrical division of the facade into five sections. The two outermost ones are n rrower than those in the center. The central section is even broader than the others, lending it additional importance Thanks to old photographs, both the palace in Safiabad (fig. lla-b) and the palace of Saahib-i Zaman in Ashraf/Behshahr (fig. 12) can be reconstructed in spite of recent changes in the building. Photographs show a cubic structure with a basically tripartite facade. Fig. 10. Farahabad. 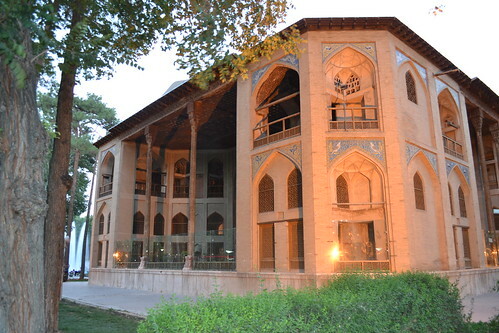 Jahan-numa palace. Reconstruction. After H. L. Rabino, Les provinces caspiennes de la Perse (Paris, 1917), pi. 97. Fig. 11a. Palace of Saflabad. Entrance. After Rabino, Les provinces caspiennes de la Perse, pi. 88. Fig. 11b. Palace of Safiabad. Building with terrace substructure. After Rabino, Les provinces caspiennes de la Perse, pi. 94. Fig. 12. 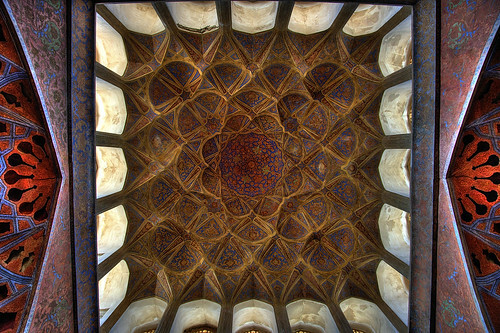 Palace of Saahib-i Zaman in Ashraf/Behshahr. After Rabino, Les provinces caspiennes de la Perse, pi. 93. Along the so-called Royal Road from Isfahan to these countryside palaces on the Caspian Sea six desert palaces acting as way stations have come down to us (fig. 13). 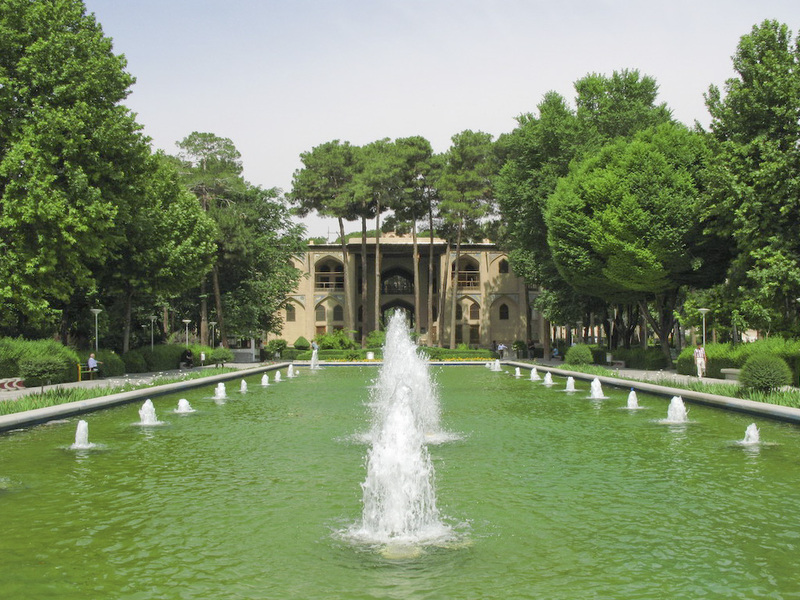 Unlike the palaces at Isfahan with their two or more stories and the two-story palaces on the Caspian coast, these have only one story and are often built around a central court just like the caravansarays that are often located near them. Those at Dombi, Sefid Ab, and Germab (fig. 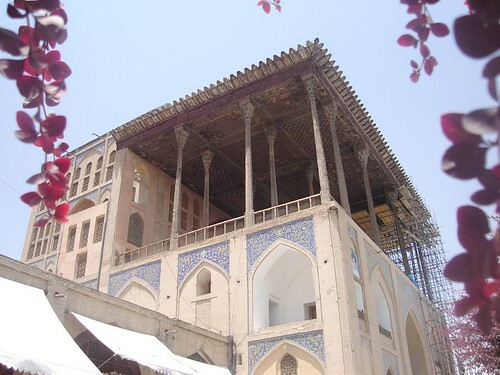 14) have two courtyards each, recalling the layout of Seljuq-period royal caravansarays in Iran and Anatolia. The courtyards are surrounded by halls and single rooms that open into them through arcades. Architecturally, these halls are designed as two-story buildings as they are seen from outside, with entrances on the ground floor and above them a line of windows, but inside there is only a one-story room with walls designed in two stories. The room is covered by vaulting, with small domes in between. 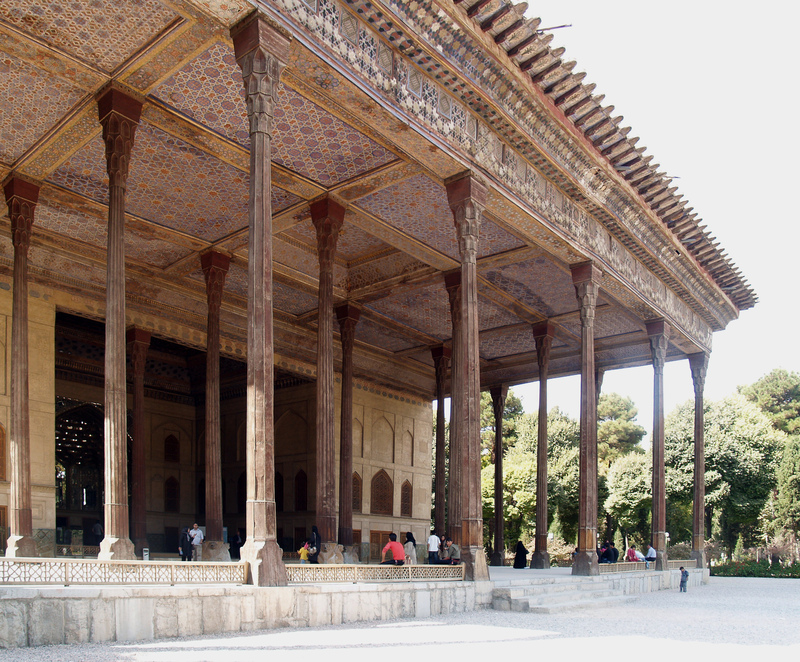 The center of each facade is accentuated architectonically by an iwan, as in Safavid caravansarays. Some have bent entrances as at Sefid Ab, to prevent people from looking into one court from the other, thus allowing one to function as a selamlik (men’s quarters) and the other as a haremlik (women’s quarters). Large caravansarays along important trade routes may have had double courts, with several rooms in one or two corners, for the separate accommodation of the royal entourage and embassies from abroad. This arrangement can be found in both Safavid and Qajar caravansarays. Along other highways small pavilions were built to serve as royal way stations as well as hunting lodges. 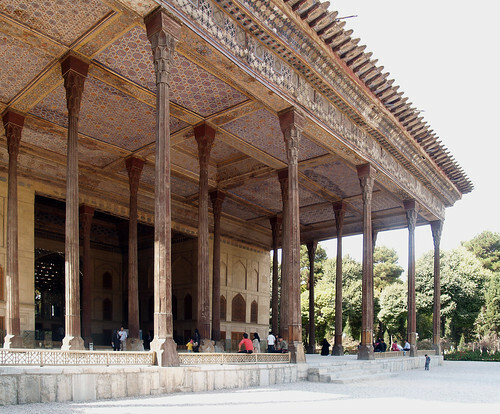 One such example is the cAliabad pavilion, with one story (fig. 2)10 and nine rooms of unequal size on a stone platform of 17.5 x 16.7 m (outside measurements) which would be too small to house the whole entourage of a prince. It can be assumed that they lived in tents in an enclosed area around the stone pavilion to which only the prince and his closest companions had access. Unfortunately all possible traces of such an enclosure have been erased from the terrain by farming. 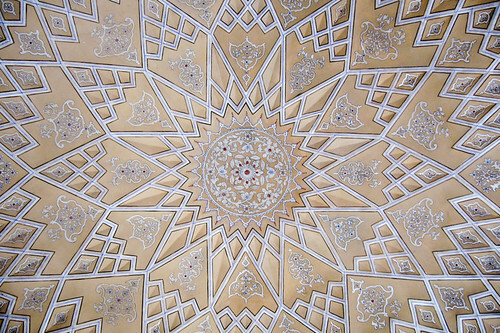 The domed rooms at the center of the cAlia- bad pavilion are richly ornamented by stellate vaults with intersecting ribs, but their state of preservation is too poor to show painting or other vault decoration. 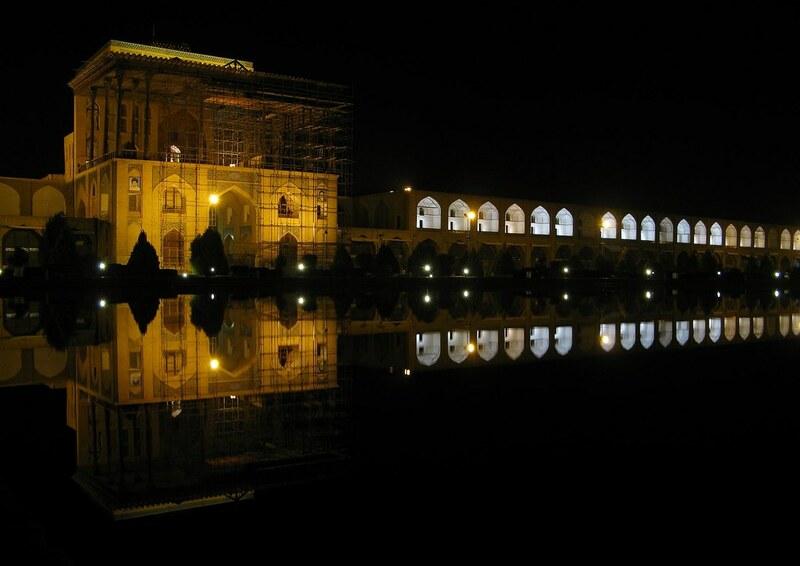 Safavid palaces in Isfahan, Qazvin, and Kashan were enclosed by walls which had their own impressive gatehouses. Several types of buildings were used for this function. 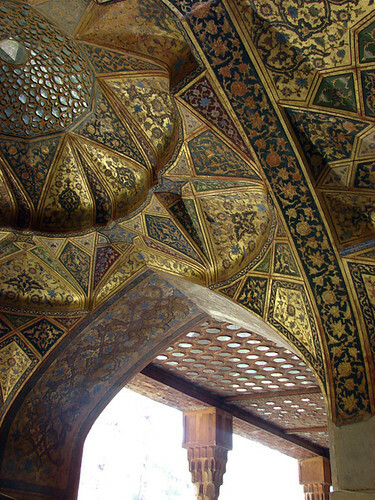 At the cAli Qapu in Isfahan11 the open loggia (talar) is supported by wooden columns standing above the gateway’s monumental ground floor. In Kashan12 the gatehouses of the palace and of the Bagh-i Fin garden bore a strong resemblance to each other, as the sketches of Engelbert Raempfer reveal (fig. 15). The facades of both buildings had a tripartite elevation. The heavily modified gatehouse of the palace quarters in Qazvin, also called the cAli Qapu,13 can be reconstructed (fig. 16) using a drawing by Kaempfer. 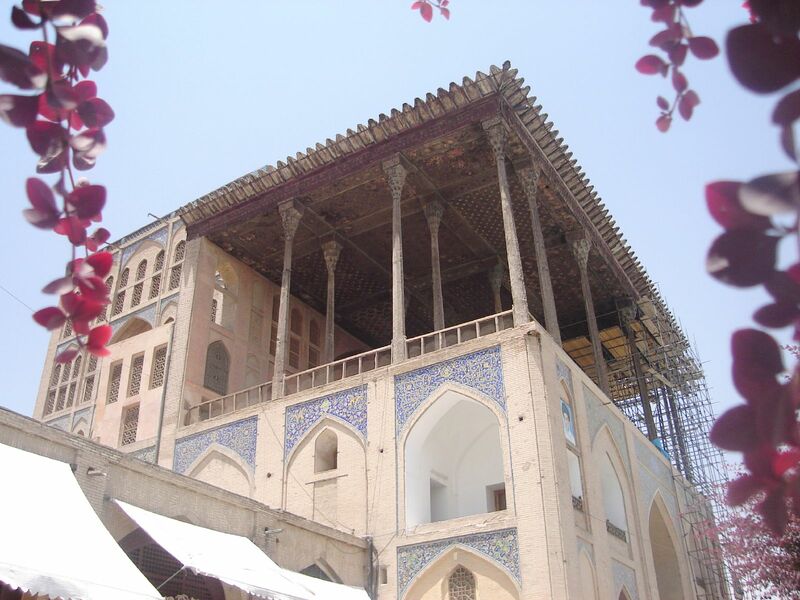 It had a facade of arcades or blind arcades similar to those in mosque courtyards and caravansarays. Fig. 16. Qazvin. Gatehouse of the palace ('Ali Qapu) as reconstructed by E. Kaempfer. From Engelbert Kaempfer zum 330. Geburtstag (1982), fig. 13. In contrast to the richly decorated interiors, the outer walls were sparingly decorated in palaces, caravansarays, and sacred buildings during the Safavid period, but their segmented facades were well proportioned. In them, structural elements functioned at the same time as decoration. The layout of Safavid palatial buildings is usually more harmonious than that of their more recent Qajar counterparts which show a tendency toward exaggeration in design, although they still firmly adhere to the building tradition of ancient Persia. Influences from abroad are hardly discernible on Safavid buildings with the possible exception of the interior design of palace architecture, where European-influenced painted decorations were widely used. 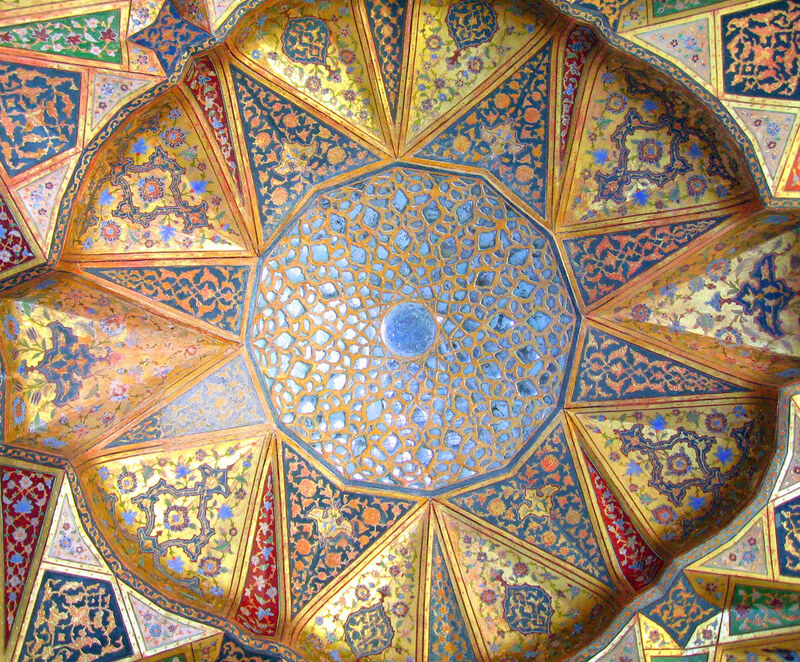 On the mural paintings of the Chihil Sutun in Isfahan, for example, courtiers of both sexes are represented in typical European dress of the seventeenth century.17 It was not until the Qajar period that the influence of European architecture was increasingly felt in such interior- design elements as local interpretations of classical columns, capitals, or mirrors (already encountered in late Safavid architecture) .18 Despite their rapid incorporation of foreign elements, however, these buildings perpetuated a long- established local tradition of palace architecture. Following images are hosted on Flickr and are being displayed here using Flickr’s own API. The copyrights of each image are held by the respective photographer. 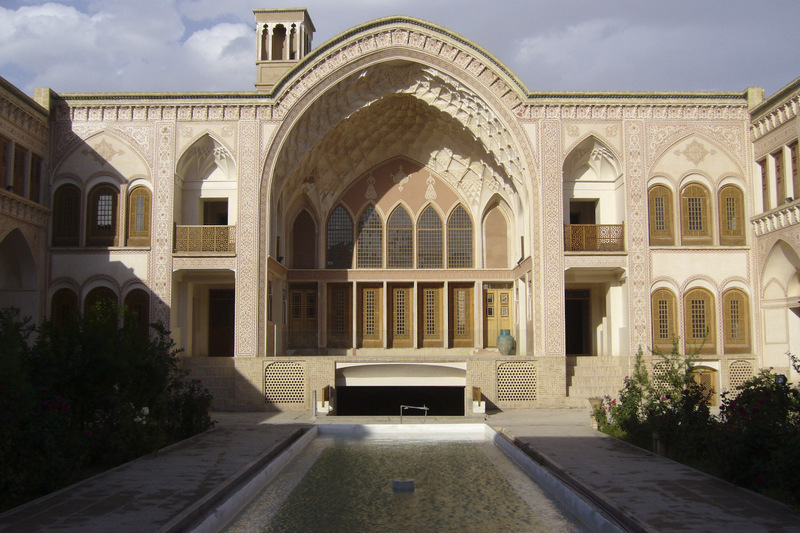 For Qazvin, see Wolfram Kleiss, “Der safavidische Pavilion in Qazvin,” Archaologische Mitteilungen aus Iran (hereafter AMI) 9 (1976): 290-98. Bibliography on the Isfahan palace is provided in Necipoglu’s paper in this volume. Arthur Upham Pope and Phyllis Ackerman, A Survey of Persian Art (Tokyo, 1967), 2:536 f.; Lionel Bier, Sarvistan: A Study in Early Iranian Architecture (University Park, Penna., 1986). Wolfram Kleiss, “Schloss Aliabad bei Furk in Fars,” AMI 24 (1991): 261 f.
Kurt Wiirfel, Isfaha n nisf-i-dschahan, das ist die Halfte der Welt (Zurich, 1974), 147-54, 160-65. Wolfram Kleiss, “Schlosser und Herrensitze auf dem Lande aus Safavidischer und Qadjarischer Zeit,” AMI 20 (1987): 345 f.
I have measured Tajabad, but have not yet published the results. Hans Hiils and Hans Hoppe, E. Kaempferzum 330. Geburtstag (Lemgo, 1982), fig. 32. Kleiss, “Schlosser und Herrensitze,” 365 f.
Henri Stierlin, Ispahan (Geneva, 1976), 72 f.
Kleiss, “Schlosser und Herrensitze,” 358 f.
Kleiss, Die Entwicklung von Palasten und palastarti- gen Wohnbauten in Iran (Vienna, 1989), fig. 67. Kleiss, Die Entwicklung von Palasten, fig. 45. For Nayin, see S. K Yetkin, Islam Mimarii (Ankara, 1959), 421; for further bibliography, see O’Kane’s article in this volume. W. Beridse, Die Baukunst des Mittelalters in Georgien (Berlin, 1981), 237 f.
K. Gink, Azerbaidjan (Hanau, 1980), 52 f.
For the mural paintings in Isfahan and further bibliography, see Necipoglu’s article in this volume. For Qajar palaces, see J. M. Scarce, “The Royal Palaces of the Qajar Dynasty: A Survey,” in Qajar Iran, ed. C. E. Bosworth and Carol Hillenbrand (Edinburgh, 1984), 329-51.